Thanks to John Melady, author of Double Trap, for the guest post about his kinsman. -ed. I was standing with my father, looking at the ruins of an old house. I thought what remained of the brickwork was interesting, until Dad said, rather offhandedly: “And this is where the murder happened.” I was rather shocked, and asked what he meant. 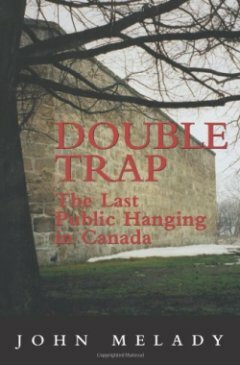 His answer led me to write Double Trap, the story of the last public hanging in Canada. Briefly, the tale goes something like this. A man named Nicholas Melady Senior, my great-grandfather’s half brother, amassed substantial landholdings in Huron County, Ontario Canada, prior to 1868. In the years just before that, he played various family members off against each other, and depending on his whim, one or other of them would be promised his inheritance. His son Nicholas Junior was used worst of all. He worked without pay for his father, was promised all or at least some of the lands, but then was told he would get nothing — several times. One night, Nicholas Senior, who was commonly called The Old Man, was in bed with his new wife, when Nicholas Junior and two of his friends, all of whom were drunk, broke into the Old Man’s house. A terrible fight ensued, and it included a hand gun and an axe, but at the end of the thing, the Old Man and his bride were dead. After some very shoddy detective work, Nicholas Junior and his two friends were rounded up and lodged in a basement cell of an old house in nearby Seaforth, Ontario. (The local magistrate owned the place.) Part of that cell still exists, including the barred window the culprits would have looked through — at the rest of the cellar. It is rather creepy to visit, and while I researched Double Trap, I did not want to be there for long, and never at night. In due course, the three desperadoes were sent to an even more chilling old jail in Goderich, Ontario. (It is now a Canadian historic site, and is visited by throngs of people every year.) There, Nicholas Junior’s friends ultimately turned against him. However, before that happened, local detectives used a unique stratagem to gain evidence against Nicholas. I could never be sure where they got the idea. They hired a beautiful young woman who was born in Michigan, (who was likely a prostitute) and talked her into spending time in a cell in the jail. She was paid to gain the trust of Nicholas, and hopefully a confession. In that sense, she was the first part of the “double trap,” in the book’s title. The woman was given the name “Jenny,” and in time, by dropping notes where he would find them, and ultimately putting herself in a position where she could whisper to him through his cell window, (she positioned herself in the women’s exercise yard; he was inside his cell), she caused him to fall in love with her. All of her notes, and his as well, were used in the trial that followed. The two never actually touched each other. When she walked into the courtroom during the trial and took the stand to describe her job and show the letters Nicholas had written, he was utterly speechless with shock. He had completely trusted her, and to him, her betrayal was total. The execution of Nicholas Melady was a macabre affair, as were events leading up to it. His death cell was positioned quite close to where he was hanged. He could hear workers building his scaffold, and while I cannot prove it, I believe he would have been able to witness the construction of the thing. The death cell still exists, and in researching this book, I visited it several times. Now that is creepy. So is the ground where he took his final few steps, out to the scaffold. It was built on top of the prison wall. He went up the steps on the inside, then lurched to his death, down the outside of the wall — where all the spectators waited to see the spectacle. His fall, through the trapdoor in the gallows floor was the second trap of the book’s title. The execution was the last public one in Canada. Three weeks later the government of the country abolished public executions because they were regarded as too barbaric. There was controversy however, around the one for Nicholas. Many people felt he had been betrayed, by his accomplices, and by “Jenny,” and so lots of talk in the community made the public officials fear that there would be demonstrations the day of the death. For that reason, they moved the execution time up by about three hours. “Only” about 300 people witnessed it. Several thousand came to see the spectacle later in the day, but by the time they reached the site, the show was over. His body was cut down, and for reasons I could never fathom, was actually waked for two days in the same house where the killings took place. Lots of the curious came to see the corpse of the killer, laid out for display. The day after the execution, the New York Times was the first newspaper on the street with the story. I could find no trace of “Jenny,” or what became of her after her jailhouse job. Her testimony in court was never really challenged. I was able to position myself in the cell where Nicholas was when he whispered to “Jenny.” I then went into the women’s exercise yard and by leaning against the jail wall easily understood how the conversations between the two transpired. The book is Double Trap, by John Melady. Published by Dundurn, and available in the United States at Dundurn Publishing, 2250 Military Road, Tonawanda, New York 14150. In Canada, the pub address is: Dundurn Publishing, 3 Church Street, Suite 500, Toronto, Ontario M5E 1M2 In Britain, the address is: Gazelle Book Services Limited, White Cross Mills, High Town, Lancaster, England LA1 4XS.